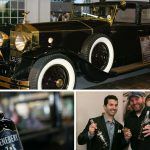 O’GARA NIGHTS FUNDRAISER TO BENEFIT CRUISE 4 KIDS - Henebery Spirits, INC.
DARE MAXIMA VIRTUS which translates to Giving Is the Greatest Virtue is written on our bottle and it is a belief that has been passed down throughout our family. Our focus of giving back to the community has allowed us to be exposed to others who also believe in contributing to the community. This month we were at O’Gara Coach La Jolla in conjunction with Cruise 4 Kids. 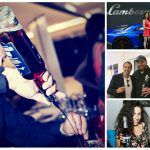 On June 23, 2016, over 300 people graced the halls of Luxury Vehicle Dealership O’Gara Coach in La Jolla, California for a summer fundraiser to benefit San Diego’s own Cruise 4 Kids organization. Virtus Bank & Karma International sponsored the event, where attending guests were encouraged to cruise around and admire the luxury cars. The 1931 Rolls Royce Phantom II from the 1950 film “Sunset Boulevard,” was featured while guests were perusing amidst a superb group of local vendors and sponsors. Everlasting Entertainment provided the music to get the party going, while Legends showcased some of their incredible auction items (including a Joe DiMaggio, Mickey Mantel and Ted Williams signed photo collage.) Greek Fusion Cuisine Meze, The Nutritional Chef, and Mimi’s Kitchen private chef provided some delicious, savory snacks. Tito’s Vodka, Fortaleza Tequilla, and Henebery whiskey were there giving out tastings of their unique spirits. Taylor Gallegos of Live Wedding art, was there painting a live rendering of the iconic Rolls Royce, while Michael leaf displayed his artistic wood and metal work along side the Maseratis! 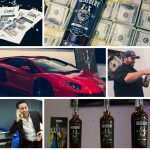 Guests had fun getting creative with the photo op in front of the Lamborghini and a suitcase filled with cash! Event photog Chris Brake was there snapping pics of people as they entered the dealership. And Sarah McAllister was there with Henebery, giving love to the vendors and taking some pictures of Henebery co-founder, Jesse Fanning in action! For a full list of sponsors and vendors, please see below and mark your calendars for the next Cruise 4 Kids event, the C4K Poker Run, September 24th!